^ social science : 大英百科 - 馬克思主義對社會科學影響. [2013-04-29]. （原始内容存档于2013-06-15）. ^ Wolff and Resnick, Richard and Stephen. Economics: Marxian versus Neoclassical. The Johns Hopkins University Press. August 1987: 130. ISBN 0801834805. Marxian theory (singular) gave way to Marxian theories (plural). ^ Comparing Economic Systems in the Twenty-First Century, 2003, by Gregory and Stuart. P.62, Marx's Theory of Change. ISBN 978-0-618-26181-9. ^ O'Hara, Phillip. Encyclopedia of Political Economy, Volume 2. Routledge. September 2003: 107. ISBN 0-415-24187-1. ^ Hall, Stuart; Dave Morely, Kuan-Hsing Chen. Stuart Hall: Critical Dialogues in Cultural Studies. London: Routledge. 1996: 418 [2013-03-04]. ISBN 9780415088039. 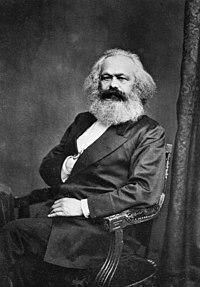 ^ Evans, p. 53; Marx's account of the theory is the Preface to A Contribution to the Critique of Political Economy (1859). 页面存档备份，存于互联网档案馆. Another exposition of th theory is in The German Ideology. It, too, is available online from marxists.org 页面存档备份，存于互联网档案馆. ^ 卡爾·馬克思, The German Ideology. [2013-04-29]. （原始内容存档于2013-04-05）. ^ Lenin 1967 (1913). p. 35. ^ Lenin 1967 (1913). p. 35-36. ^ Documents on the Russian Revolution. Marxists Internet Archive. [2011-05-16]. （原始内容存档于2011-05-16）. ^ Rees, Simon. historicaleye.com. [2011-05-16]. （原始内容存档于2011-10-05）. ^ The Hungarian Revolution of 1919 (i)|International Communist Current. [2011-05-16]. （原始内容存档于2011-07-16）. ^ Working-class activity and councils — Germany 1918‑1923 - Peter Rachleff|libcom.org. [2011-05-16]. （原始内容存档于2011-06-04）. ^ The History of the German Revolution: 1918-1923. Marxists Internet Archive. [2011-05-16]. （原始内容存档于2011-04-09）. ^ 24.0 24.1 Collectivization and Industrialization. Ibiblio. [2011-05-16]. （原始内容存档于2011-04-10）. ^ T. J. Byres, Harbans Mukhia. Feudalism and non-European societies. Psychology Press. 1985: 207 [2010-11-28]. ISBN 0-7146-3245-7. ^ The Great Debate: Documents of the Sino-Soviet Split.. Marxists Internet Archive. [2011-05-16]. （原始内容存档于2011-06-08）. ^ Behind the Stalin-Tito Clash. [2011-05-16]. （原始内容存档于2011-02-16）. ^ Coltman 2003 and Bourne 1986. ^ Robert Vincent Daniels. A Documentary History of Communism in Russia: From Lenin to Gorbachev. Lebanon, New Hampshire, USA: University of New England Press, 1993. Pp. 48. ^ Michael Harrington. Socialism: Past and Future. Reprint edition of original published in 1989. New York, New York, USA: Arcade Publishing, 2011. Pp. 42. ^ Service, Robert. Comrades: Communism: A World History. Pan MacMillan. 2008. ISBN 0-330-43968-5. ^  页面存档备份，存于互联网档案馆 What We Can Know About The World. Hans F. Sennholz. ^ Von Mises, Ludwig. Economic calculation in the Socialist Commonwealth (pdf). Ludwig von Mises Institute. 1990 [2008-09-08]. （原始内容存档 (PDF)于2008-09-23）. Bourne, Peter G. Fidel: A Biography of Fidel Castro. New York: Dodd, Mead & Company. 1986. Alex Callinicos|Callinicos, Alex. The Revolutionary Ideas of Karl Marx. Bloomsbury, London: Bookmarks. 2010 . ISBN 978-1-905192-68-7. Castro, Fidel; Ramonet, Ignacio (interviewer). My Life: A Spoken Autobiography. New York: Scribner. 2009. ISBN 978-1-4165-6233-7. Coltman, Leycester. The Real Fidel Castro. New Haven and London: Yale University Press. 2003. ISBN 978-0-300-10760-9. Green, Sally. Prehistorian: A Biography of V. Gordon Childe. Bradford-on-Avon, Wiltshire: Moonraker Press. 1981. ISBN 0-239-00206-7. Karl Marx. Wage Labour and Capital. Germany: Neue Rheinische Zeitung. 1849. Trigger, Bruce G. A History of Archaeological Thought (Second Edition). New York: Cambridge University Press. 2007. ISBN 978-0-521-60049-1. Avineri, Shlomo. The Social and Political Thought of Karl Marx. Cambridge University Press. 1968. Dahrendorf, Ralf. Class and Class Conflict in Industrial Society. Stanford, CA: Stanford University Press. 1959. Kołakowski, Leszek. Main Currents of Marxism. Oxford University Press. 1976. Parkes, Henry Bamford. Marxism: An Autopsy. Boston: Houghton Mifflin. 1939. Screpanti, E; S. Zamagna. An Outline of the History of Economic Thought. 1993. McLellan, David. Marxism After Marx. Basingstoke: Palgrave Macmillan. 2007.